I’ve been watching Pinterest pretty closely over the past couple of months. It’s the most interesting new player in the social space since Twitter debuted, largely because of its extraordinary growth (especially among women). Personally I see it as a kind of visual Delicious, combining my visual interest with my love of collecting and organizing. Pinterest’s growth creates challenges, though. They need to make sure the site is beneficial both for users of the site who want to share and for artists who create work worth sharing. Sharing images on social networks is nothing new, but Pinterest takes a different (and more troubling) approach. On sites like Facebook and Twitter, there’s often a reasonable assumption that someone will click through an image or link to find more information about a photo that’s been shared by friends. When you click on a shared link on those networks, you’re taken to the image’s original source.1 That’s great for content creators, as it brings new people to their site and gives the creator the chance to show new visitors their work. Pinterest is different. When you add a new pin, you’re asked for the address of a web page; the site loads the page, pulls a prominent image from the page, and shows it within Pinterest. While you’re viewing your friends’ pins, there’s no direct way to visit the original source; a source link is only available on the pin detail popup. (Clicking the full-size image or the inconspicuous source link above the image sends you to the source site.) These popups show images at full size, so there’s very little motivation for normal users2 to visit the original author’s site; the Pinterest user can view everything from his friends without ever leaving the site. It’s worth noting that it’s possible to separate pins into two categories: those that encourage a user to visit the original source (recipes, products, craft tutorials, etc.) and those that don’t (photographs, style, and design). I see Pinterest as an amazing opportunity for the first group; a user would see a photo of a great recipe, for example, and would take the time to head to the source site to find ingredients and steps. Pins from the second group don’t fare so well for the original author; for a pretty sunset photo, it would be much easier for a normal user to comment right within Pinterest and move onto the next pin than it would be to visit the source site to view more from the original artist. That’s a lost opportunity for a photographer, artist, or designer. I’ve heard some people respond by saying that Pinterest won’t hurt artists; the increased exposure could benefit them, and even if it doesn’t, it wouldn’t cause them to lose any business they would’ve otherwise had. I think that’s true in most cases, but it doesn’t mean that it won’t cause problems for Pinterest – or that there aren’t better ways to approach it. Given how popular Pinterest has become, it’s only a matter of time until some artists, designers, and photographers decide that they want to control how (or if) their content appears on Pinterest. It’s happened with Napster, it’s happened with YouTube, and eventually it will happen with Pinterest. There are two ways they could do this within the current system. Some will likely send DMCA-backed cease and desist notices to Pinterest on the grounds of copyright infringement. This will probably cause Pinterest to develop some sort of system to blacklist certain sites from being pinned (say, hypothetically, pins of pages from cnn.com wouldn’t be allowed on the site). It’s an inconvenience for users – and probably not the best option for content creators, either – but the legal road is quick and effective. A more creative (though, I’d argue, even more annoying) solution would be for artists to add prominent watermarks to all the images they post. 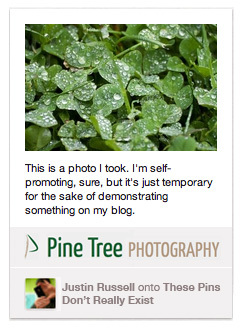 It’s one way for an artist to maintain the exposure via Pinterest while still branding the images from her site. Again, though, it’s not an ideal solution for either the artist or the viewer; watermarks have a tendency to wreck the aesthetics of an otherwise beautiful image. Needless to say, I don’t like either of those options. But what’s the alternative? I want Pinterest to succeed. I really do. I think it’s a great concept, and I think in the end it helps content creators more than it may hurt them. There’s also an amazing opportunity waiting to happen for artists if Pinterest decides to offer it. What then? Well, with a source program in place, Pinterest could offer the opportunity for users to follow artists or brands. If you like one post by a particular artist or designer, how about having the chance to see whenever anything new is posted from that person? For pins from one of those categories that don’t encourage a click-through, I’ll always credit the photographer and source in the caption for the pin. I’ll never write a caption that discourages people to visit the source site (for example, explaining the steps of how to make a craft). I may use watermarks on some of the photos on my sites, but I’ll never make them obtrusive. I’ll try my hardest to preserve the integrity of the photo. I want to use Pinterest for the same reasons I use other social networks: finding great stuff and sharing it with the people I know – all while supporting the awesome people who make the stuff I love. 1 This has changed a bit recently on Facebook as people have started to download images to their computer and then upload them as “Wall Photos”, but you still can’t enter an image URL on Facebook to have it shared without attribution. The difference here is that Facebook and Twitter draw out this process and put the burden on the user to download and re-upload a photo. On Pinterest, the default “Add a Pin” behavior is to grab images from another site via a URL. 2 The term “normal users” is tricky. I think there’s a small segment of the site users who will investigate original sources anyway: most likely other artists, photographers, etc. I think the behavior of a typical user would be to stay within the at-a-glance, self-contained system of Pinterest, though, without investigating further. I’d love to see stats from Pinterest that show click-through rates to sources. In the interim, why not add the “banner” yourself to your images? In other words, instead of a watermark mucking up your design, why not run a strip along the bottom of each photo as part of the image that identifies your or your site? It would make the image size a little larger, but would carry your branding through repins until Pinterest offers this kind of (interesting) option. I doubt anyone would go through the trouble of cropping the strip… and if they did, they wouldn’t have been affected by the branding you describe, anyway? Heather: That’s probably the best possible idea for in-image credit; I’ve seen a couple of sites do that, and it’s a lot less obnoxious than a huge watermark. It might pose some a design problem for sites that publish multiple images in a post (the bar might disrupt the aesthetics of the post), but if I ever do find that I need a very visible way to brand images, that “banner” option will be the way I go. I’m also interested to see how Pinterest users will respond to any rise in watermarks or branding. Will they still pin those kinds of images? I think you’re right that cropping would be too much of a process for most people; I wonder if they’ll shrug off the watermarks or if they’ll decide they clutter up a board.